Now the neck might be a bit long, but I'll call that artistic license (the stubby neck looked wrong);) This is not a dinosaur, it's too early, but some think it was one of the precursors to the earliest dinosaurs. 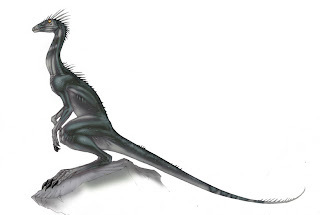 This was a small animal, Dinodata has it listed at .30 meters, so around a foot. And more than likely, it could run on it's hind legs from short bursts.